Ever heard of the Museum of the Confederacy? Chances are, you haven't. But this historic, unsung museum in Richmond, home to the "other White House" during the Civil War, is a must-see for anyone interested in the Civil War. The Museum of the Confederacy and White House in Richmond, VA.
Before I tell you why, I have a confession to make which may horrify you. Growing up in Southern California, it wasn't until I was in college that I fully realized which side was which in the Civil War. Were the Yankees the “South,” or was it the Confederates? Shocking, I know, but as California schoolchildren, we were too busy trying to memorize the names of the Spanish missions to care much what happened on the other side of the country 150 years ago. You'll be relieved to know that I got my facts straight long before I moved to Virginia. But it makes me sympathetic to the fact that many people--even in Virginia--really know little about the Civil War other than the basics. 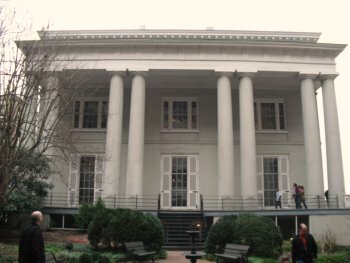 Located in Richmond's historic Court End neighborhood, about two blocks from the State Capitol, the Museum of the Confederacy actually has two parts: the restored Confederate White House where Confederate President Jefferson Davis lived with his family during most of the Civil War, and a three-story museum housing the world's largest collection of artifacts, documents, and photos from the Confederate States of America (CSA). 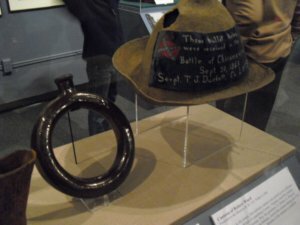 You'll see lots of rare Civil War artifacts, like this hat with a bullet hole through the crown. The best part of the museum? Hands down...the house tour. At the White House of the Confederacy adjacent to the museum, you can tour 11 restored rooms on a guided, 40-minute tour. Built in 1818, the gray stucco mansion with soaring columns was home to significant drama, both as the location of many crucial military and state meetings during the war, and in Jefferson Davis’ personal life as well. Stories abound about the overall mayhem in the house as Davis’ famously undisciplined children roamed the halls. The house was also the location of personal tragedy when the Davis’ five-year-old son, Joseph, fell from the 3rd floor portico and died. The house’s role as Executive Mansion ended in 1865 when Richmond fell to Union troops and Davis and his family fled to Danville, among other places. And what became of Davis? Captured in 1986, he was indicted for treason (though never brought to trial or convicted), and stripped of his US citizenship when he refused to ask for a pardon. He eventually lived out his days in Biloxi, Mississippi, before dying in 1889. His body was later reburied in Richmond’s Hollywood Cemetery, next to the body of young Joseph. When we went, we had the most amazing docent. She was so interesting and well-informed (and we asked so many good questions!) that our tour actually took 70 minutes...and we would have stayed if it had gone longer! The Museum of the Confederacy is located at 12th and Clay streets in Richmond. Hours are Mon.-Sat. from 10 am to 5 pm, and Sundays from Noon to 5 pm (closed on major holidays). You can visit either just the Museum of the Confederacy or the White House for $10 for adults, $8 for seniors, and $6 for youth (ages 7-13). Since both are well worth a visit, a better deal is to purchase a combo ticket for $15 for adults, $13 for seniors, and $8 for youth (ages 7-13). They have a AAA discount, and active duty military (with ID) are free year-round. 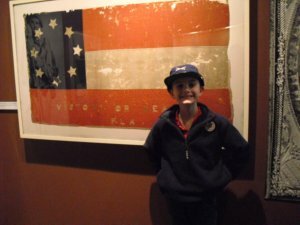 If you really want to complete your Civil War experience, $20 gives you admission to both of these museums, plus the Museum of the Confederacy museum in Appomattox (where General Robert E. Lee surrendered to Ulysses S. Grant and ended the Civil War). You can learn more about the Appomattox museum by going to www. moc.org. The museum also participates in the Richmond Civil War Pass, which includes admission to both museums, plus the American Civil War Center at Historic Tredegar, site of amazing iron works during the war. The combo ticket for all three sites is $18. 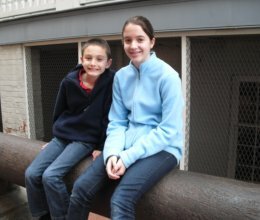 Sitting on cannons outside the Museum of the Confederacy in Richmond. The museum is located in downtown Richmond, smack dab next to Medical College of Virginia, so the only parking is in the hospital's pay parking lot. BUT, if you visit on Sunday afternoons, parking is free! -- Looking for more things to do in Richmond? Go to my Richmond Attractions Page.